Gareth Huw Davies - Conkers in crisis - can horse chestnut survive annual onslaught by pests? Conkers in crisis – can horse chestnut survive annual onslaught by pests? Horse chestnuts in appropriately-named Chestnut Av, Halton, Bucks, their leaves turned a premature brown by the burrowing of the larvae of the leaf miner moth, September 19th 2017. The damage caused by the larvae of the leaf miner moth in horse chestnuts seems particularly severe in parts of Southern Britain this year. While not fatal in itself, the moth may fatally weaken the trees. Autumn comes prematurely in sad little pockets of England and Wales. As early as July the leaves of the horse chestnut, the conker tree, begin to turn an unnatural and unseasonal brown, and by September entire trees can be afflicted. The culprit is the larva of the leaf miner moth. Its annual infestation of horse chestnuts has been widespread, mainly in Southern Britain, for about 10 years, yet it rarely makes the news. This early autumn effect is conspicuous in the mainly urban and suburban landscape – most horse chestnuts were planted by people, for people, to decorate roadsides and green spaces. But other trees catch up in a month or so, their leaves turning brown and falling at the usual time, so we stop thinking about the horse chestnuts. And then, next spring, with a flush of fresh leaves, the trees are just as green and robust as ever and all seems to be well. And unlike more devastating scourges of our trees, most notably the Dutch Elm disease beetle, which almost wiped out the elm in the 1970s, the pest, at least on its own, does not significantly damage the trees, as most of the leaf discolouration occurs late in the season. Yet experts say the annual predations are already weakening trees, and this may make them more susceptible to attack from other sources. Some give the horse chestnut only five years before a combination of pests, led by the leaf miner, wipe it out. If this pessimistic prognosis is correct, there is a strong case for preemptive action by councils and other public bodies to plant replacement pest-resistant trees. But there is little sign this is happening, or even of informed discussion of the problem in Britain’s fast-contracting local media. The first detailed study of the range and severity of the leaf miner moth infestations is being undertaken by the Forestry Commission. The findings will be published soon, possibly as early as the end of 2017. The commission has monitored 300 chestnut trees in southern England twice a year, recording the level of infestation, the tree’s condition, its growth and signs of dieback. Trees are also being checked for other ailments. The horse chestnut leaf miner was first identified in the UK in 2002, in trees in the London Borough of Wimbledon. It has spread north, south and west, to most of England and parts of Wales. There has been one confirmed case in Scotland. The moth was first seen in Europe, in northern Greece, in 1985. It quickly spread throughout Europe. The moth extends its range by flying, with wind assiatance, and through moths or infested leaves being transported in or on vehicles. This last cause is the probable reason for the sudden appearance of the moth in towns and cities far from known areas of infestation. The horse chestnut itself originated in Greece and the Southern Balkans. It is thought to have been first planted in England in the 1500s, possibly from Istanbul, where it was first propagated. Even limited control of the leaf miner appears to be a costly and labour-intensive business. 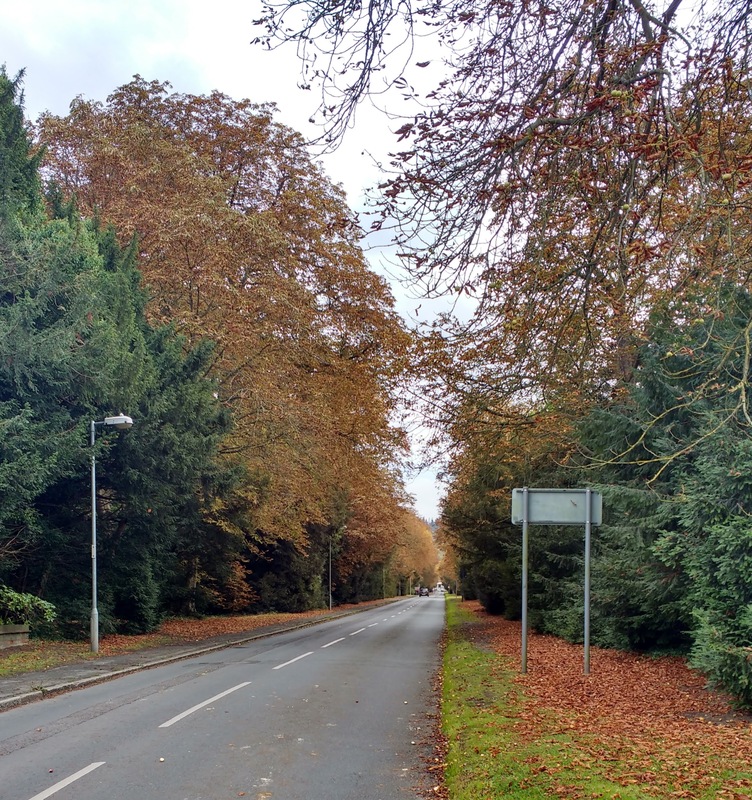 Collecting and burning fallen leaves in autumn will reduce the overwintering pupae, but which local authorities have the budget to do that, even if they regard it as their responsibility? Another course of action that might make sense with some isolated trees where fallen leaves can be gathered up, is to compost leaves in sealed bags until the following July, by which time adult moths should have emerged and died. A pheromone trap to attracts male moths is commercially available. This might reduce the mating success of the moth and the level of infestation, but there seems to have been no serious study of its efficacy. And the effect is likely to be limited. The organisation Conker Tree Science enrolled “citizen scientists” to track the spread of the leaf miner over several years. Project organiser Dr Michael Pocock concludes that in the “vast majority of places” the leaf miner is here to stay. He believes it is horse chestnut bleeding canker that is likely to cause the demise of the tree in England. Dr Glynn Percival, manager of the Bartlett Tree Research Laboratory at the University of Reading, agreed that the prognosis was bad, unless something was as found to control the miner. “In trees that have leaf miner we do get an increase in the severity of bleeding canker because they have so little energy to defend themselves. “Our research shows trees without leaf miner produce conkers twice the weight of those with – 8g against 4g. We planted them, and the germination rate [of the 4g conkers] is lower and the vigour is lower. There’s a definite knock-on effect, our data shows. The affected trees’ conkers are smaller and they have less vigour when germinating because of leaf miner.